Water sports and especially swimming, are often cites as a favourite form of exercise. There are many physical benefits of swimming and because of the low impact nature of the workout, swimming is considered terrific a exercise choice for not only healthy people, but also for those who face health challenges. Most children enjoy the water, especially when they are accompanied by Mum or Dad. While people can certainly learn to swim at any age, some parents feel that getting kids acclimated to the water at an early age is best, making swimming second nature to them. 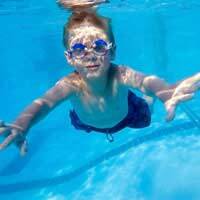 Swim classes are available even for babies, who typically show no fear of the water. When classes are begun later, some kids may be a bit uneasy at first, but with gentle persuasion can usually learn to enjoy swimming, so parents should try to ride out any initial resistance from their children in hopes that after a few tries, the kids will welcome water play. Swimming can provide a gentle, easy bit of activity or full-fledged aerobic training, depending on the effort level and duration of the workouts. For those who are simply looking to stretch and tone muscles, active water play can be the perfect light workout, but when swimmers choose to push themselves to achieve distances, swimming can strengthen the heart and lungs. Often considered largely an individual sport, student swimmers can also join competitive swim teams, making swimming a sport that kids and teens can enjoy no matter their opinions about working out alone or as part of a group. Overweight kids who don't enjoy many sports may find swimming to be a pleasure; movement in the water may be easier, making fitness fun for even those who have shied away from other forms of exercise. Kids with Juvenile Arthritis (JA) are typically left out of traditional physical education classes and may have difficulty with even the simplest movements, but the weightless feeling that water provides can make it much easier for kids with JA to get in a little daily exercise. Exercise can help alleviate some of the stiffness associated with JA and is considered necessary not only for the overall health benefits, but also to prevent joint deformity which can occur with inactivity. Asthmatic kids sometimes find that exercise can bring on attacks, making them reliant on the use of rescue inhalers, but many of these kids can swim without experiencing any difficulties. Indoor swimming is especially favoured because the warm, moist environment makes breathing easier, as long as the pool is not over-chlorinated. While swimming can provide kids and teens with great workouts, parents need to keep safety at the forefront of their minds when introducing their children to the water. Kids are naturally inquisitive and may be inclined to leap into the water before they are capable swimmers, so parents must be sure to provide adequate supervision at all times. Kids should never be allowed to swim alone, even once they are adept in the water, and home swimming pools should always be fenced in order to keep children from taking an impromptu swim when Mum or Dad are not around. Also, parents should never view inflatable pool toys or flotation devices as lifesaving tools -- air loss can render them useless or children may simply lose their grip, putting themselves in danger rather quickly. Providing swim lessons for kids can help them to stay safe, but pool rules must be explained to children and strictly enforced. Finally, parents and others who plan to swim with children should be schooled in CPR and lifesaving techniques, should an emergency situation present itself.